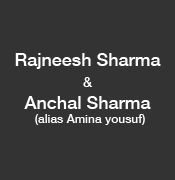 Profile of the victim : Anchal alias Amina, who married Rajneesh after a seven-year-long love affair, converted to Hinduism by changing her name to Anchal Sharma. They were married in August, 2009 in Jammu at the Arya Samaj Temple. The accused : Anchal sharma alias Amina yousuf has accused her father Mohammad Yousuf Mirazi and brothers Javed and Tariq of conniving with the police to kill her husband. Place of Murder : Munshi Bagh police station in Jammu. Date of Murder : 5th Oct 2009. Assassination : Rajneesh Sharma was found hanging to death on October 5, 2009, at the Munshi Bagh police station, after being picked up from his Jammu residence on September 30. Though the police maintained that Rajneesh had committed suicide in the lock-up, Anchal and other family members alleged that he was tortured to death by the police, at the behest of the father of the Muslim girl whom he had married. According to Anchal Sharma, Rajneesh was murdered by the police after being kept in illegal custody and the death was made out to be a suicide, at the behest of her parents who were against the marriage.